THE percentage of job vacancies filled by Singaporeans rather than foreigners has reached its highest level since 2011. Nearly three out of every four positions in the first half of the year went to Singaporeans, said the Monetary Authority of Singapore (MAS) in its latest macroeconomic review released yesterday. 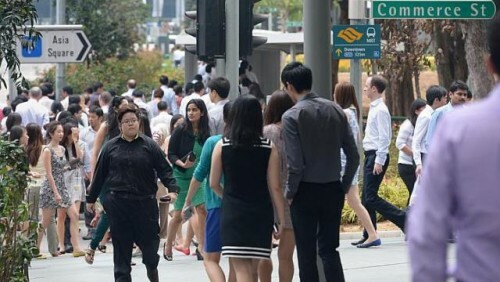 It also said the tight labour market will continue to drive up wages and employment for Singaporeans, although it also means that firms are increasingly passing on higher costs to consumers. The share of new jobs filled by locals shot up to 73 per cent in the first six months of the year - far higher than the 31 per cent in the same period in 2011. This follows multiple rounds of foreign labour tightening measures implemented as part of ongoing restructuring efforts, which aim to raise labour productivity. But four years into economic restructuring, progress remains slow. Labour productivity inched up just 0.2 per cent a year from 2010 to last year. Productivity fell 0.3 per cent in the first half of this year over the same period last year, dragged down by the weak performance in the service and construction sectors, the MAS said. In the same period, resident wage growth came in at 3 per cent "with no cost offset from productivity". Higher wages led to unit labour costs rising 3.1 per cent from January to June, compared with 1.2 per cent from July to December last year. Productivity growth will be constrained in the short term, given the lack of a strong cyclical rebound in the global economy, the MAS said. "It will also take time for firms to reduce their reliance on workers, especially in construction and services," it added. This means labour costs will continue rising in the near term. Businesses in the food-related sectors and labour-intensive services, where demand remains firm and labour constraints are most binding, are more likely to pass on the higher costs to consumers. Meanwhile, competition and tepid global demand have kept a lid on price increases in export- dependent sectors. The MAS said it expects core inflation - a measure of the rise in everyday out-of-pocket costs - to remain elevated into the next year, even as overall inflation numbers remain relatively subdued. Core inflation averaged slightly over 2 per cent in the first three quarters of this year. Overall inflation is set to be 1 per cent to 1.5 per cent this year, while core inflation is forecast at 2 per cent to 2.5 per cent. "Since the balance of risks remains slightly tilted towards higher core inflation, the prevailing monetary policy stance continues to be optimal in ensuring domestic price stability over the medium term," the MAS said in its review. Earlier this month, the central bank said it will stick with its policy for a relatively strong currency. Singapore conducts monetary policy by managing its exchange rate against a basket of the currencies of its major trading partners. A stronger Singdollar helps to dampen inflation by making the prices of imported goods lower.